We use the power of social media and email marketing to grant wishes for sick and disabled children. 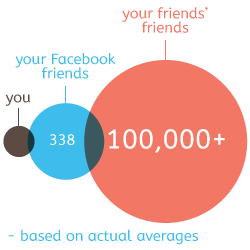 Facebook users have an average of 338 friends. Then, each of their friends has the same number of friends on average. Pay It Forward Networking brings those connections together to help children in need using the power of networking! You can imagine the potential to grant many wishes by simply sharing these wishes! Through Pay It Forward Networking, we can use everyone's connections to bring smiles to the faces of these children, one wish at a time! You simply make a wish by completing the application and telling us the child's story, including their diagnosis, and their wishes. Once the application is approved by our Board of Directors, we will send it out via social media and newsletter to see if anyone has connections to help! There are no guarantees, but our network is full of generous people that want to help others, especially those in their community. You may not be able to afford to help due to your own circumstances, but by simply sharing our wishes, you could be the connection we need to someone that is willing to grant a wish and help a kid experience a lifelong dream they could never image! READY, SET, PAY IT FORWARD!